Feeling inspired by the beanies the athletes at the winter games have been wearing? 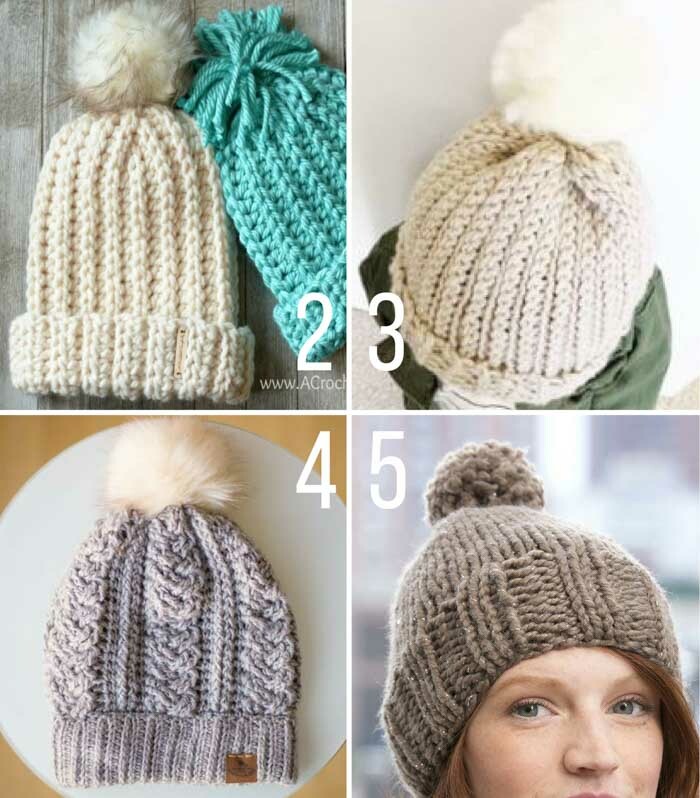 Let this collection of FREE knit and crochet chunky hat patterns lead you to your next “slope style” project! Please tell me I’m not the only one spending about five hours a night watching Olympics, crocheting and admiring all the #yarnporn atop the athletes’ heads? Some of my favorite sports to watch have been the snowboarding and skiing–partly because of the gravity defying tricks and partly because of the fantastic selection of hats, beanies and headbands everywhere I look. As a knitter and crocheter, my obvious thought when seeing most of them has been, “Hey! I could make that!” And you, my friends, can too! I’ve collected some of my favorite chunky hat patterns, both knit and crochet, that resemble the current trend toward ribbed, cabled and yarntastic beanies. 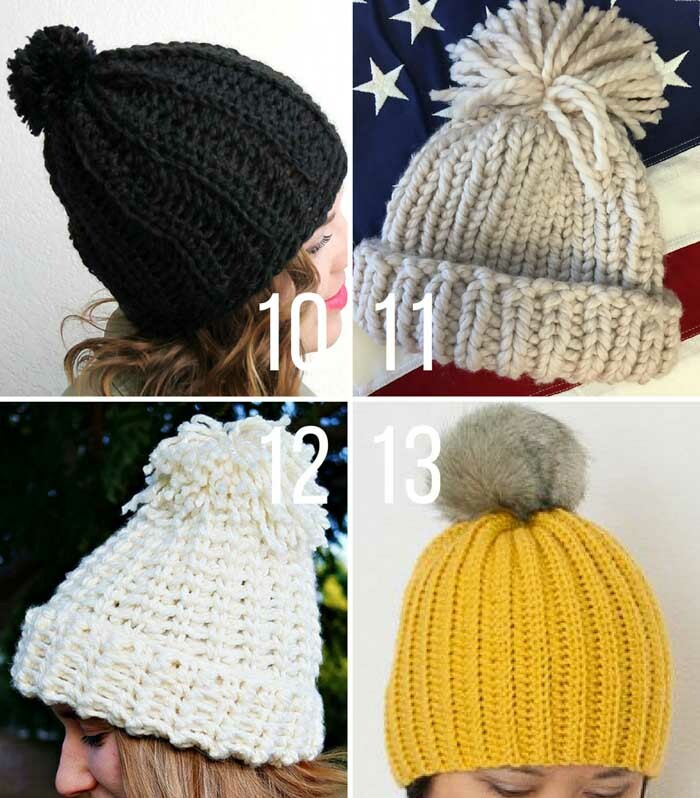 And if you like pom poms, the following list of chunky hat patterns is definitely going to be your jam. 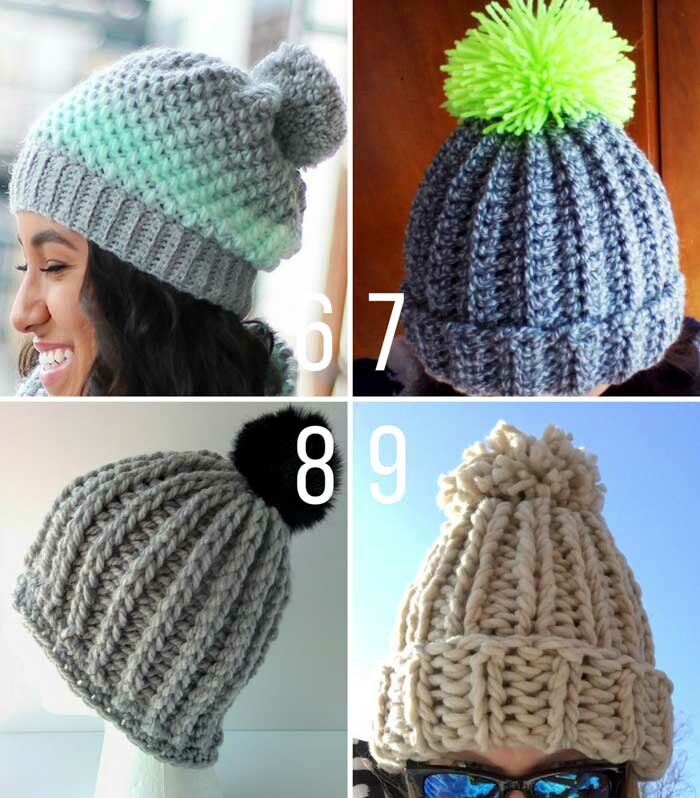 Plus all of these knit and crochet beanie patterns are FREE! 1. 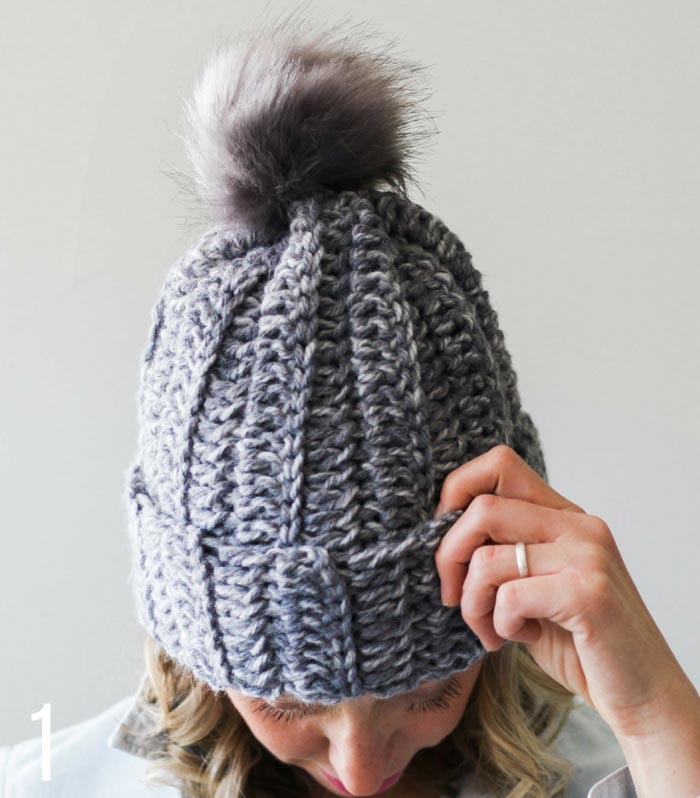 The 1.5 Hour Chunky Hat Pattern by Make & Do Crew – Don’t let the ribbed look fool you- this knit-look beanie is all crochet and extremely easy! If you can crochet a rectangle, you can make this fast and simple unisex beanie pattern. Beginner video tutorial included! 2. The Super Bulky Slouch Crochet Beanie by A Crocheted Simplicity – With just one hour and one skein of yarn, you can crochet this chunky knit-look beanie by A Crocheted Simplicity to keep you cozy all winter long. 3. The Crochet Ribbed Beanie by Sweet Everly B – This free crochet beanie pattern by Sweet Everly B is based on a simple rectangle and uses slip stitches to create a ribbed knit look with crochet. 4. The Braided Cabled Slouchy Crochet Beanie by All About Ami – The gorgeous crochet cables add an elegant touch to this braided slouchy hat by All About Ami. 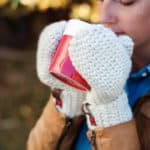 The free pattern includes a photo tutorial to help you if you’ve never tried cables before. 5. The Lorimer St. Knit Beanie by Lion Brand – This chunky knit hat pattern is a classic style that has withstood the test of time. And the Wool-Ease Thick & Quick yarn means you can whip this beanie up faster than you can say half pipe. 6. 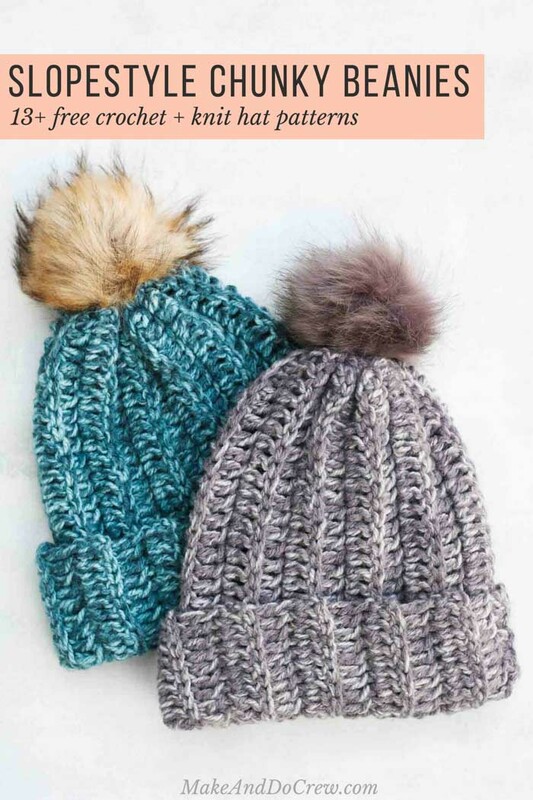 The Landon Mother and Daughter Slouch Crochet Hat by Little Monkeys Crochet – Little Moneys Crochet uses the mini bean stitch to make an adorable mother/daughter matching chunky hat set. 7. 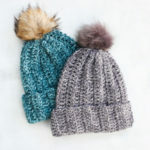 The Crochet Super Easy Ribbed Hat With Pom Pom by Turtle Crochet – This super fast beanie pattern uses simple crochet stitches to create the look of ribbed knitting, making it perfect for beginners. Sizes newborn-adult! 8. Madeline Chunky Ribbed Crochet Beanie by The Blue Elephants – All you need is one skein of yarn to create this one-size-fits-all ribbed crochet beanie. 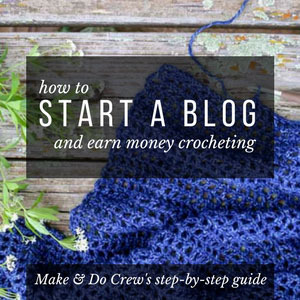 The free pattern by The Blue Elephants also includes a video tutorial. 9. The Gold Medal Knit Hat by Jen Geigley – Whether you’re slopestyling it up like Chloe or just running to the grocery store, this beginner-friendly knit hat pattern will keep you toasty warm and uses the basic single rib stitch. 10. Chunky Ribbed Slouch Crochet Hat by Persia Lou – Persia Lou uses half double crochet stitches and bulky yarn to create a beautiful texture for this ribbed slouch crochet hat. The simple pattern makes this a great beanie for beginners! 11. The Olympic Inspiration Chunky Knit Beanie by Barrettangie – Holding two strands of yarn together creates a nice bulky look for the Olympic Inspiration beanie by Barrettangie. This chunky knit beanie will keep you snug and stylish, whether you’re participating in the Olympics or watching them from the couch. 12. The Chunky Knit-Like Crochet Hat by Nicki’s Homemade Crafts – The classic waistcoat stitch, also known as the knit stitch, is perfect for making crochet beanies that look knit. This beanie from Nicki’s Homemade Crafts is worked in a round and is surprisingly easy to make. 13. 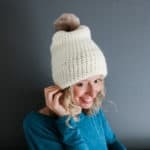 The Lolly-Poms Easy Ribbed Crochet Beanie by 1 Dog Woof – Perfect for beginners, this easy ribbed pom pom beanie from 1 Dog Woof is another chunky hat pattern made from a basic rectangle and thus would make a speedy gift for your ski and snowboard buddies. If all these chunky hat patterns aren’t enough, you can find all my free crochet beanie patterns here! They all look so warm and cozy! I agree! I wish I had time to make all of them!